Mount Carmel Mission Matric. Hr. Sec. 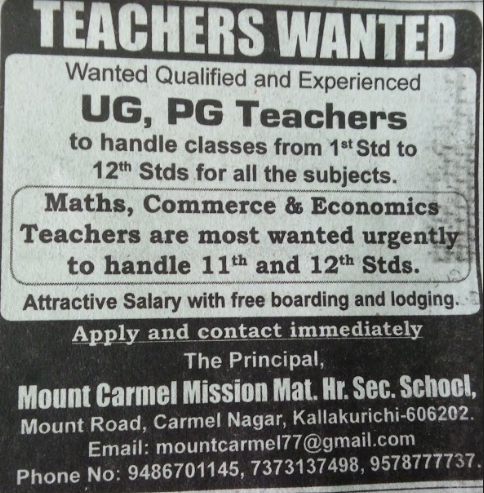 School, Kallakurichi has advertised in the DINATHANTHI newspaper for the recruitment of Teachers PGT / TGT jobs vacancies. Interested and eligible job aspirants are requested to apply immediately from 07th October 2018. Check out further more details below. About School : Mount Carmel Mission Matric. Hr. Sec. School, Kallakurichi is a private school affiliated to Matriculation board. How to Apply: Interested and eligible candidates are requested to send application along with CV, copies of certificates and recent PP size photographs to the following email address / postal address or contact immediately the Principal of the school through phone.